Lobbyist’s wife running Charles Sargent’s campaign. You got to admit, it takes a certain amount of nerve (or a sufficient level of stupidity) to face the voters and declare that they are your primary concern, while you rake in money from a lobbyist AND employ the lobbyist’s wife as your campaign manager. The unseemly (some would say”sleazy”) little arrangement comes from Sargent’s relationship with Pfizer pharmaceuticals. Pfizer’s lobbyist is one Josh Brown, a former executive assistant to Gov. Don “Income Tax” Sundquist. Since taking on Pfizer as a client, Brown has funneled thousands of dollars to Sargent’s re-election campaigns. In fact, over the last couple of elections, no other individual legislator has received more money from Pfizer than Charles Sargent. Now fast-forward to this year’s primary election in August. 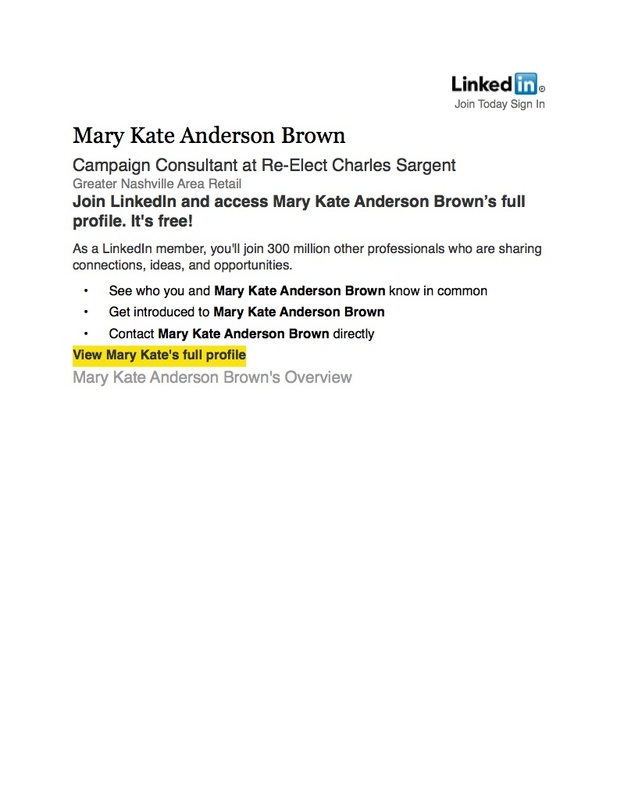 Brown’s wife, Mary Kate Brown, lists herself as working for the Sargent campaign. Below is a screen shot of her LinkedIn page. Sargent has paid Mary Kate thousands of dollars in campaign consulting fees and his reports list her as his “campaign manager.” How cozy. Sargent couldn’t get any closer to the Brown’s lobbying and consulting businesses than if he moved into their spare bedroom. Unfortunately, no. It’s just what passes as “ethics” among some in the Tennessee legislature.